Discussion in 'General RPG Discussion' started by Scrawled, Mar 20, 2016. Granted, the map they've shown is a lot less elaborate, but given that it all happens after the end of the world, it kinda makes sense in-setting. When I say "post-Victorian" I'm referring to the period between 1901 and the beginnings of WW2, in which the Prohibition era is included, and which encompassed most of Lovecraft's writings. I've read all of Lovecraft's stories at least once and often several times each, I'm very familiar with the trappings of the era, and generally I pop into these threads from time to time hoping to find something that seems authentic or evocative. The medieval map snippet instantly caught my eye (though at the time it would be an antiquity), but sadly it was only an example. Thanks to that pesky thing called subjectivity, we could argue about it all day. There's nothing wrong with the maps, but they do nothing for me in terms of being evocative of the period. I just want an option for joining as a servant of the old gods with some of my sanity intact! The party is able to travel long distances in the regional map, but in order to do that, the player must acquire the necessary information pertaining to the location and content of those landmarks. Less-than-Fallout, but that was a pipe dream. Hey backers, I’m Mehmet Reha Tugcu, the UI designer of Stygian and I’m here to talk a bit about our user interface. Our primary goal while designing the UI was to preserve the aesthetic of the game while maintaining the user friendliness of modern games. Much like the RPGs of old, our HUDs are highly decorative and textured. Even though our UI is a homage to the godfathers of the genre, we’ve tried to avoid their flaws like cluttered elements and confusing players with information overload. Hopefully older players will feel right at home using the interface while newer players won’t be overwhelmed by the depth of the game. We’ve spent a lot of time on perfecting the typography. With a single glance, players will be able to discern the flow of information through the header fonts,colors and sizes. Stygian has so many different UI panels; the character screen, inventory, map, character creation, exporation, combat, grimoire, journal and much more. With a UI this vast, it was extremely important to be consistent with our design language so it would all feel connected and immersive. Aesthetic wise, we used real paper, leather and marble textures on a lot of the panels. Our grimoire was made from scratch using paper scans overlaid on top of each other. Every scratch and burn mark on it was placed intentionally. The UI uses a lot of dark shades and textures that complement the game world. All of our panels open as pop-ups, you’ll still be able to see the world of Stygian around these panels. All these decisions were made to avoid immersion breaking transitions between the game and the UI. Stygian is primarily designed for PC and the UI takes advantage of that. Our inventory is huge and includes features like filters and a search bar. We also have a dynamic cursor with a gem embedded inside that changes color depending on what it’s hovered on. Most modern games develop their UI in the last few months, with Stygian we designed the UI with the game itself and as the game grew, so did the UI. Our exploration UI went through several iterations, we’re currently in the process of adding gemstones that represent the character’s visibility in stealth. I’ve had a lot of fun making the UI of Stygian, hopefully you’ll enjoy using it as well. Feel free to check out the details of the UI from the link below. It’s from an older version but it’s pretty close to what the finished product will look like. Take care! Ah, don't you worry dear, you'll learn more in time. Just be patient. Take your medicine now and be a good patient. Until we meet again in the filthy corridors of Arkham Sanitarium. replay the demo, the game promises to be amazing. Audio is best I ever hear. The pnp mechanic looks studied, hope game will have enough content to fully support it. 1. would be immersive to force match the character picture (bust) with body doll (in inventory, on game screen). 3. hope for map travel. The manual walking each screen, is wearing (bank with F... poster). Also the map trip could be interrupted by any curious event (or plot trigger). 4. picking up items. I sometimes want to take one item. Would be nice to close the pick up window, just by clicking anywhere outside of it (instead clicking the X). 5. remove the need for key press after location loading (let it auto go to next location). 6. would be dope if high Presence (+ from clothing) reduce the chance for triggering combat with sane humans (citizens, mob, cultist). Also would be nice if Presence & Speech-craft could affect the chance of ending combat with sane human enemies - during combat you speak out yourself from fight. On the basis of "What are you doing?! His bleeding. Why you do this? We dont want to fight. Lets speak about this. We just go.". Ofc you can not relay on it when confronting animals, monsters or insane opponents. Maybe it can be implemented into the chance of current "progressive retreat"? the laudanum shot could reduce the pain (& be highly addictive). Pain from wounds (hp lose) could reduce the AP. p.s. during one combat i decide to retreat (violet hex) low on HP Eduardo. I didnt expect that my main character also decide to give up the fight and his life (he was'nt insane yet). I totally understand how you feel and it can't be more natural for you to expect us to abide by the estimations that we indicated. I also would like to state that the contribution of every single one of you, regardless of how big or small, enabled us to wake everyday to continue doing the most amazing job in the world, which is creating interactive worlds. Due to this feeling of debt, we always esteemed the crucial matter of delivering what we have achieved so far, directly to you, whether in the form of a 1.5 hour long demo that showcases the game, or detailed updates that informs you about our progress in different spheres of the game, such as art or design. I wish we could post even more but the only reason behind this is we're solely focused on actualizing Stygian. Stygian is a challenging project that surpassed our expectations but also our estimations. The easy way out was to cut content or features or both, yet for better or worse, we decided not to do that. We've always wanted to craft something memorable, not only from the artistic point of view but also from the narrative and gameplay perspectives. Sure, some of the locations in the game would have been completed with less revisions, some of the dialogue would have worked with less attention to emotional consistency or some systems would have worked without meeting some rare cases. But we believe that a role playing game derives its power from the details and the personal relation that the player develops with the game through them. For more than two years we've been working on this game everyday, and for most of my team, there hasn't been a single weekend that is not touched by some aspect of Stygian. We do this out of two reasons: First, we simply love this project and second, we simply can not let either you or ourselves down. As a person who is directly witnessing the development of the game everyday, I am proud of the work that the Cultic team is putting into this game. In addition to that, we secured an agreement with a dependable publisher that actually aids us. I know that the second half of 2019 seems like a distant future to you, or shall I rather say the "Black Day", but as far as our health allows (I know I did not use the term "sanity"), this game will be completed in a form that will have provided all of its contributers a chance to do their best. Then it will be up to you to enjoy it or not, but in the meantime, please understand that it is our duty to fulfill the vision of this game, being its humble servants. I don't think the alternative would make anyone happy. I hope I managed to portray our motivation towards Stygian and our desire to meet your expectations. We sincerely wish to see each one of you as a resident of the doomed Arkham upon Stygian's release. Without you, we wouldn't have been in this journey after all. They have quite a hill to climb after Atom, but at least I can depend on this to be significantly less memey. Stygian demo is best Role Playing game I played, I never feel so "part" of the world. I cannot trick myself to perceive the game world, without taking into account the game rules or NPC reactions to my character. art in SRotOO is perfect, I hope you would not change anything & only thing your artists work now is more location backgrounds. put as much narrative, as you can -more NPC dialoge in reaction to PC action. for wall text, please try to keep current quality. rules - be careful with combat, to not make it a boring chores (esp. if you need to kill all lesser creature for XP). Hope SRotOO is not aspiring for a tactic combat simulator. I will welcome more mechanism to avoid combat. Hide in game more optional mechanism of getting "knowledge", to gain advantage (f.ex. to avoid combat). Would be nice, if there come circumstances, when guns would not be the optimal weaponry in my characters hands. with Stygian I feel like before SitS, but Serpents has a mediocre, not well made gameplay. Take your time, because you would probably drop the game after (& I would love Serpents to receive more patches). Meet us at PAX South 2019! we will be present at PAX South 2019 with the latest demo of Stygian! It would be our pleasure if we could meet some of you there to chat and showcase you the game! We will be at booth #10220! new demo , on the other hand i better wait for final version, dont want in the future to replay again known part of game. Playing the demo wasn't overly spoilery considering that it didn't have that much of the game in it, just maybe the start of a single quest. If a new demo comes out on steam then I am definitely going to be trying it out. I am so ready for this game. Just hope they stay away from the level and combat design they used for the bank quest in the demo. It was unfortunate, to say the least. The game has the potential to have fun combat, they just need to make it a little more complex. Just hope they stay away from the level and combat design they used for the bank quest in the demo. It was unfortunate, to say the least. The game has the potential to have fun combat, they just need to make it a little more complex. Ahh, seems they took my advice on the UI. Back when it was first displayed I told them it should be more like Arcanum in terms of immersive style design over pure functionality. Now it looks much better. Kudos, fellas! I like the way the p'n'p ruleset looks and I'll definitely get around to playing this again sometime. I played the beta awhile back and didn't get too far due to being distracted by other things. the demo is the same from last year? It looks the same as it always has? Hmm, i dunno. I remember distinctly on this site making a big post about it, comparing screenshots of Arcanum's UI to their current UI, and pointing out how the style should be more immersive and resemble the style of the game. The UI at that time was pretty plain. This was before the beta was even out, which they gave me access to. I'm pretty sure it was this game. UI has looked very similar/the same as it does now since the kickstarter pitch, as far as I know. Hmm, maybe it was another game then. I could be wrong. I know I posted on here about some game's UI that should look similar stylistically to Arcanum's, with screenshots and comparisons. Ah well, disregard that post then. But the UI hasn't changed, so I guess this is one of those "That's not how I feel today" things. Does this mean new previews are coming? I hope so. Many of you must have had a long and arduous journey to fulfill the exigency of your pilgrimage, which had centennially taken many of your ancestors to this decrepit hall of elder mysteries in loyalty to my timeless bidding. Once again I trust you, wise seedlings, that your offering will be a most tainted, deliciously profane soul of one of your devout kinsmen, whose tantalizing essences we will gnaw and devour, delighting my ever so starved belly that has rumbled for no less than a century. Descend into the pits wherein I dwell children, and delay the procession no further! Now that we've fed our little worm with its favourite dish that is the fresh corpse of a witch, we can get on with our update without further ado. Abdullah rigorously draws and paints each and every inventory item, sparing no attention to even the most minute of details. A stripped down exhibition of the colouring and texturing procedures that were applied to the “House of Spectres”, a mysterious location smothered by mists that linger on the verge of this extra-dimensional reality. “Insofar as Stygian's artistic production process is taken into perspective, it can be said that every asset conceptualizes and is later implemented into the game through a scrutinizing approach." Perhaps the most vividly striking of our animations are the ones that are drawn frame by frame for our spell animation sequences. Here you see the casting of “Tongue of the Dead”. Pseudo-scientifically accurate, blueprint type illustrations are what we preferred for our crafting interfaces. Note: If you value your sanity, do not read the placeholder names. 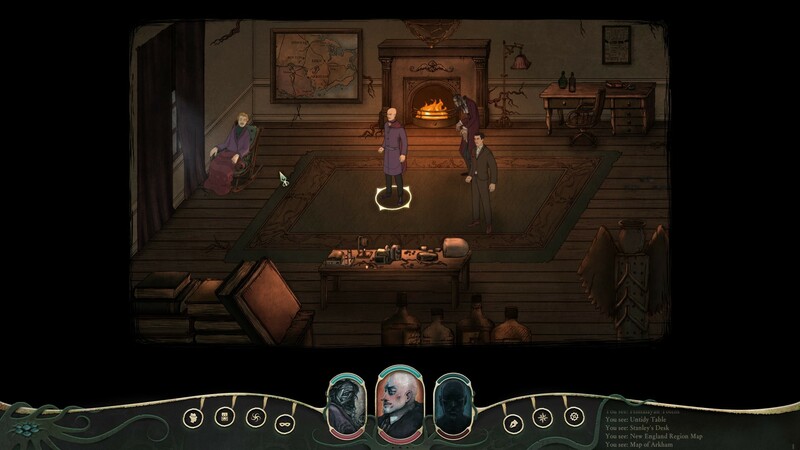 “Stygian is the first game project that I've been involved in. I feel that it has added great qualities to my work. With eagerness, I'll be anticipating the player's comments upon its release." Another fine example of the steps taken to realize the final coloured state of a puzzle sequence that promises to divulge its shocking revelation once all the parts are assembled in the correct order. It seems we have reached the end of the road for today. Before we leave, this time we have a question for you, cult brethren: What would you like to see in the next update? The Comments section is right below! I may be dum-dum, but is this the first time this has been mentioned?